Japanese Episode DP 168: "Fly, Shami! To the Ends of the Sky!!" American Episode 1312: "Keeping in Top Forme!" While Satoshi and Hikari are busy training, Takeshi notices a boat floating by with an unconscious girl inside. Once the boat is brought to dry land, the girl wakes up and introduces herself as Mai. She has a basket that she needs to deliver to a Gracidea garden on the other side of a nearby mountain, but the Rocket-Dan are following her. So, she asks Takeshi to accompany her the rest of the way. After reluctantly accepting her request, our heroes discover that Mai's basket contains the legendary pokemon Shami! She explains that the pokemon had started following her the previous day and that it needs to reach the garden so it can begin its flower bearing. She's afraid that Shami will be unable to complete the journey by itself, so she hopes Takeshi and his friends will help her protect it from the Rocket trio. After an uneventful journey, everyone eventually makes it to the garden only to find it completely devoid of Gracidea flowers! Since Shami only needs one of them to trigger its transformation, the group decides to split up and comb the area for any remaining flowers. As soon as they locate the last ones, the Rocket-Dan appear and try to capture Shami one more time! Luckily, the pokemon is able to transform into its Sky Forme and gain enough of a power boost to send the Rocket-Dan's mecha blasting off. After the battle, Shami reunites with a group of other Shami and begins its journey to spread flowers throughout the land. The TV series is a very carefully planned merchandising mechanism, and this episode is a perfect example of that. A new Pokemon Ranger game was coming out, so they obviously wanted to advertise that in some way. 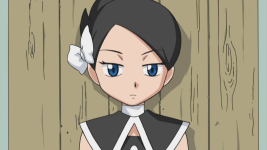 Meanwhile, in the games this TV series is based on, one of the five trainers who joins your party has a connection to the legendary pokemon Shami. Well what do you know? The new Pokemon Ranger game has a Shami mission as well! Why not kill two birds with one stone and advertise both games at the same time? Brilliant! It is a very smart move, marketing wise, but it really feels like Mai wasn't used to her full potential. The problem is that she doesn't really do anything. Why does she only use her Windie in the flashbacks? Why doesn't she join Satoshi and the others when they're battling against the Rocket-Dan? I'm trying to figure out how this episode would have been any different if she wasn't in it, or if she had been replaced by any other character-of-the-day, but I'm not coming up with anything. I'm also a bit perplexed at how Satoshi and Hikari are so out of character when it comes to helping Mai out at first. How many times has Satoshi and Hikari (well, to an extent, anyway) dropped everything they were doing to help some random person they just met solve some problem that has nothing to do with them? Don't get me wrong, I actually like that Satoshi and Hikari questioned whether or not they should actually bother to help a girl who fell asleep in a boat. I just think that it's weird that they're only doing it now. On the bright side, I'm a huge fan of all the focus Takeshi gets in this episode. I also really liked the fact that everyone already knew who Shami was, which kind of helps the whole "the movies are in the same canon as the TV series" argument. But I think my favorite part of this episode has to be how Mai's still with the gang at the end of the episode but is then nowhere to be found in the next one. She obviously parted ways with the gang at some point, and I wish we had gotten to see it because it must have been hilariously awkward. Satoshi and Hikari don't really have any love for the girl and Takeshi only agreed to help because he felt sorry for her, so seeing everyone bid farewell to a girl no one really likes would have been great fun. Too bad we missed it. Shaymin gets dubbed over even though it only says its name in the Japanese version. I blame this on the fact that the English name is the same as the official romanized version of the Japanese name, something I covered back in the "Giratina and the Sky Warrior" comparison. One thing I neglected to mention back then is the term "Gracidea" and how the dub mispronounces that as well. The Japanese pronunciation is "grah-shee-day-uh," but the dub, in both this episode and in the movie, use "gray-suh-dee-uh." They also put an emphasis on that first syllable, something the Japanese version doesn't do. Narrator: "Dawn and Ash are finding the forest a perfect place for some valuable training. As Ash prepares for his upcoming gym battle against Volkner, Dawn prepares for the Grand Festival, as Brock keeps a watchful eye on both." Originally, the Japanese narrator mentions the Lakeside Resort where the Grand Festival is set to take place, something his English counterpart fails to do. The English version also brings up Brock, something his Japanese counterpart fails to do. You win some, you lose some, I guess. Ash: "Wonder who she is." In the Japanese version, Hikari asks if she's a doll. I'm wondering if the English version changed this line because "life-sized dolls" and "kids' show" aren't two things you typically associate with one another? Marley: "This Shaymin doesn't want to go with you." Meowth: "Your ribbon's on too tight." Originally, Nyasu asks Mai who she is. Meowth: "When those dumb dopes get a load of the robot waitin' for them it'll knock that ribbon right off of that sleepy twerpette's noggin." I'm not sure why TPCI is so obsessed with that ribbon on her head, but then again, I'm not sure why TPCI does a lot of the things it does. Nyasu's original line, by the way, is that they'll use their new ultra robot to finally catch Shami. Brock: "I'll say this, you're persistent." James: "Like night follows day." Jessie: "We have to be in order to keep up with your persistently dimwitted twerpish shenanigans." Musashi's line there originally says that they stick to things as much as (or, are as persistent as) mochi after it's been pounded. As you may know, mochi is extremely sticky and can be very difficult to chew. It's strange to see TPCI remove a reference to Japanese food - that seems more like a 4Kids type of change to me - but in this particular case I guess it's not that big a deal. The names of the Rocket-Dan's mecha are all different. Mecha Caterpie is known as "Mega Caterpie" in the dub, Musashi's mention of Trancell becomes "Maxi Metapod" (thank goodness the pokemon's name isn't Metapad instead! ), and Mecha Butterfree is known as "Blockbuster Butterfree" in the dub.